I would like to dedicate this page to my best friend Phyllis Bell Hamilton/Lockwood who passed July 29, 2002. Everyone should have been as lucky as I to have a friend like Phyllis! From Route 6 in Skinners Eddy, PA, take route 367 about 5 miles to the village of Silvara. Don’t cross the first bridge into town. Park right there on the right side of the road and walk up that narrow path to the Cogswell Cemetery. 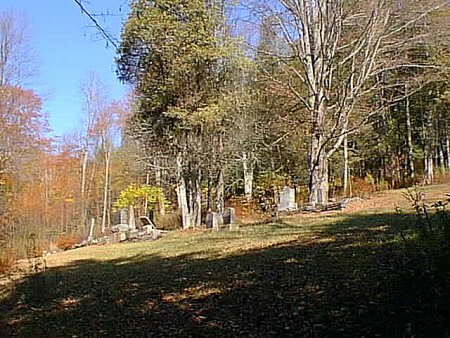 The cemetery on the opposite side of the road across the Tuscarora Creek is the Silvara Family Cemetery. This cemetery is often called “Hillside”. It is very difficult cemetery to read, the stones deteriorating, sinking and literally washing out of the ground and down over the incredibly steep incline on which this cemetery was built. In the June flood of 1972, which was brought on by Hurricane Agnes, people used to stand on the bridge entering the town of Silvara and watch the pieces of the old wooden caskets float by. They were washing out of the Cogswell Cemetery. There is a large spring that is near the top of the cemetery on the right. A huge gully indicates it produces great quantities of water in the rainy season. The weather is very dry this fall (2002) and it is still very moist. The only headstone left on the right side of that spring is that of Clara Bennett Ruger. With the spring being prolific, then add to that the run off heavy rain rushing down the hillside toward the creek, plus the raging Tuscarora Creek factor below eating away at the already soft banks, it is a wonder anything is left in that cemetery. That could explain the absence of grave markers between Clara Ruger and what is now the main part of the cemetery. Most the stones in the main part of the cemetery are on man made stone ledges and very sturdy foundations. Perhaps the section below the spring and 15 feet to each side was never used for burials. Or just possibly maybe some of these folks washed out along with the graves nearest the lower edge. A flagstone marker or two can still be found on the steep banks of the Tuscarora Creek. Just paths are mowed through the cemetery now. The brush is growing up around most of the headstones making it difficult to find them, let alone to read and record the data. Many are flat on the ground and sinking in, or just being covered over with moss. The effects of acid rain are taking its toll. Many are eroded beyond the point of legibility. The Cemetery was originally associated with the Freewill Baptist Church and its beloved Pastor Rev Bela Cogswell who is in the first row alongside his family. Joseph Atkins and his wife the former Emma Cogswell, a daughter of Rev Bela Cogswell are the first graves you encounter when entering the cemetery after the long climb to the top. Joseph was the only secretary for the Freewill Baptist Church. I will do look-ups from the ledger if anyone desires information. Andrew Kennedy’s dates are 1838 to 1919. He was buried with his first wife Julia Treadwell Peet who died in 1910 in the West Auburn Cemetery, Auburn Township, Susquehanna County, PA.
Joseph was the son of Joseph and Harriet Gray Atkins. He was the secretary for the Freewill Baptist Church in Silvara. Joseph and Emma Atkins are the first headstones depicting burial in the first row of the cemetery followed by Rev Bela Cogswells family. The stones of Emma and Joseph are individual stones, which are rounded on the top. Sumac is growing up around them. There is a duplicate headstone in the Fred and Tammy Hemmerly lawn in Silvara, PA. This was a tall white stone with a rope and tastle decoration. It records the Joseph H Atkins was born March 18, 1836 and died May 17, 1878. The two “alike” stones replaced this stone after Emma passed. Bacon, Malinda, born May 18, 1827 died in December 7, 1907 this is from her death certificate filed by Minnie Cogswell, no headstone that I can locate. Malinda was the wife of Ezra Bacon: (January 28, 1819 to September 30, 1880, buried in Franklin Center Cemetery). The children in this family are all accounted for except Ezra Bacon Junior who was born about 1861. He could possibly be buried here we just do not know? Her parents were members of the Freewill Baptist Church. Died August 5, 1912, age 4 years. According to Leo Bolles diary he was buried August 7, 1912.Leo and Bertha Crawford Bolles attended the funeral. He is buried in the very top of the cemetery with the Crawford family. His dark stone has the beautifully etched gates of heavens opening wide for him to enter. His parents are buried in the North Flat Cemetery, Laceyville, PA. This family is peeking out of the bramble so to speak. The stones are in a mass of overgrowth on the right edge of the cemetery half way up the hill. They are in the first row of the cemetery. This is a tapered tall stone with Rev Bela on the front panel and the other family members on the side panels. The stone is showing much wear. He was the Freewill Baptist church minister. He started out his career in the ministry as a Methodist, but changed his viewpoint towards religion about 1850 when he became a Freewill Baptist, a group who stood up against Slavery. He was a founder of the Silvara Freewill Baptist church in 1856. She died a Christian according to the Church records on page 27. “Crafts History of Bradford County”, PA offers the following biography on this subject. Rev. Bela Cogswell was born on the place on which he now lives, January 10, 1817. 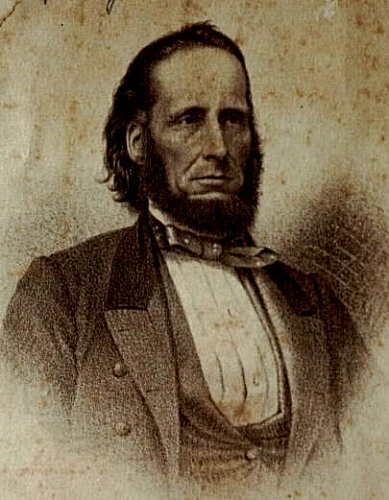 Elisha Cogswell, the grandfather of Bela, came from Connecticut in company with two brothers, and settled in what was then the "Far West," about 1785 or 1790. He was by trade a miller, and had the charge of the most important mills on the river, among which was the Ingham mill at Sugar Run. He afterwards purchased a farm on the Tuscarora creek, where he lived until his death. Edward, the son of Elisha Cogswell, married a daughter of Bela Ford, who lived on "Ford Street", in Pike township, and settled on a part of his father’s farm, in what has been known as East Spring Hill, where he died June, 1877, at the age of eighty-one years. He was a man of unquestionable integrity and sincere piety, and held an official position in the church for more than sixty years. Bela, the son of Edward, or "Uncle Ned", as he was familiarly called by the people of his neighborhood, was a self-made man. In his boyhood the facilities for education were very inferior to what they are now. He improved those which he had to the best advantage, studying and reading as far as he could, until the people thought he was qualified to teach, when he taught several terms. Previous to 1837, before he was twenty years old, he was licensed to preach the gospel, and for more than forty years he has been engaged in the work of the ministry, and preached to the same people. He was one of the original members of the Free-Will Baptist church on the Tuscarora, and was mainly instrumental in its organization, and in erecting the pleasant church edifice, which is used by the congregation. This church as a marble pulpit of unique construction, and on the marble tablets surrounding it are the names of the members, pastors, contributors, etc., a constant reminder of the worshipers of those who are affiliated with them in the ties of the spiritual brotherhood. Mr. Cogswell has been their first and last pastor. In addition to his duties as pastor, he has frequently had to perform the official duties of a citizen, having, besides other township offices, been justice of the peace fifteen years. He married, Oct. 19, 1837, Eunice Prentice. She died in 1870. There were born to them seven children: Abel B., who died March 7, 1839, Sophronia M., Emma R., Mary A., Stella A., Osmer E., a young man of great promise and flattering prospects for success and usefulness, who was accidentally killed Nov. 16, 1876, leaving a young widow, and Ward B., the youngest, who is at home with his parents. Mr. Cogswell was married a second time, May 22, 1870, to Lydia Fuller, widow of the late Stillman Fuller, who died in South Carolina, where he and his wife were employed in teaching the emancipated blacks by the United States Freedman’s Bureau. Mr. Cogswell retains his vigor unimpaired, and bids fair to live many years and to do much useful work in his profession to the community. (Polly Bertha Lewis Cogswell Dimon), Dimon, Bertha L, May 21, 1855 to ---- (December 10, 1941), the death date is not etched on the headstone! Bertha outlived Hosmer Cogswell 65 years. Hosmer E Cogswell was suspended from the Freewill Baptist Church for unknown reasons January3, 1869. Neither Bertha nor Hosmer Junior were ever recorded as members that I can find. Bertha can cause some confusion. The book "Cogswells in America" by E. O. Jameson records Bertha Sturdevant married on May 23, 1876 to Hosmer Cogswell. We find in another Cogswell genealogy, possibly the same book, but I used a Xeroxed version, that Bertha is the adopted daughter of Jacob Drake and Maria Lathrop Sturdevant. The Cogswell genealogies record no parents for her. 1860 Tuscarora census, is she there as POLLY? A Roots web Website for Lewis records her name as Polly Bertha Lewis, the daughter of Edwin and Polly B Lathrop Lewis. Her father died June 26, 1856. Her mother died the same day she was born. "After the death of Zeruah, Sanford was left alone, in this world, there being no children to this union. He was next united in marriage to Mrs. Bertha (Lewis) Cogswell, who has been a true and devoted wife during his remaining years." A year before his death they lived at South Main St. in LeRaysville. He was a Civil War Veteran, a private with the 141'st PA. Volunteers. It seems her maiden name might have been Lewis. I would like to add Sanford Dimon was the son of Gilbert and Hannah Wilson Dimon. Lydia was the 2nd wife of Rev Bela Cogswell. Rev Havens conducted the service. The Rev Walsh married Alpheus Crawford and Harriet Fuller daughter of Jonas and Clarissa Main Fuller on November 11, 1860 in Susquehanna County. His pension file records December 13, 1860. I use first marriage date listed as his granddaughters agreed upon November 11, 1860. Ruth Benscoter Wood tells me that her grandfather is up there at the top of the cemetery with his arms around both of his wives! Maria was a spinster when she married Alpheus on February 24,1909. She was the daughter of John and Jane Coates Benscoter. A little lamb atop a heart graces this small leaning stone, which is slowly eroding away. I can find no stone marker. Depew, Elisha, his father is also there with no stone that I can locate. The information on this family came from a newspaper clipping with no date belonging to Mae Fassett. Dickinson, Helen, daughter of Israel and Lulu, died about 1920; age 11 years. There are two flagstone markers next to Israel Dickinson’s marker; she could be one of these. We just do not know. Dickinson, Israel. 1873 to 1937, He was buried March 30, 1937. Crawford families. He was married to Lulu Brown who was born about 1878. She is probably here without a stone too. She could be the other flagstone marker in the lot. I have no death date for her. Farr, Margaret Patricia, daughter of Mr and Mrs Minor Farr. Age 3 months; this information is from an obituary in the scrapbook clippings of Mae Fassett, no date or name of newspaper listed. I can find no marker for her either. Patricia Margaret Farr, aged 3 months passed away in the home of her parents Mr. and Mrs. Miner Farr in Silvara on February 22, __She leaves 2 brothers and 3 sisters. 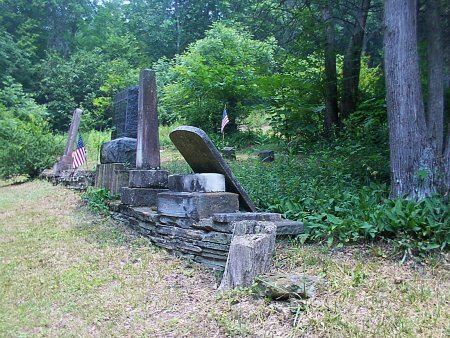 Interment was in the Hillside Cemetery, Silvara, PA. Regarding the Farr Family: Miner Farr (August 15, 1907-August 30, 1970) was first married to Sarah Redmond, and 2nd to May Dickinson June 16, 2931 in Mehoopany, PA. She was born April 10, 1912 to Israel and Lulu Dickinson. Company A 151st PA Volunteers in the Civil War. He is half way up the hill on the far side of the cemetery. His wife is probably there with no marker, Hannah Bump. She was born about 1826 and died after 1880 and before the 1900 census. A single flagstone marker graced by the American flag. HOLDREN is the name on the headstone! Holden is on census! Holdren, Lillian A, November 5, 1862 to February 3, 1881, daughter of Henry and Sarah Holdren listed on the 1870 Tuscarora Township census. Holdren, William H, no dates listed but by census he was born about 1834. The Holdren family stone is rather large and tips backwards! Note there is a spelling change in the name from Holdren on the headstone to Holden in the census. Part of the family used Holden and the other Holdren. Holdren was used in the Freewill Baptist Church records to record Sarah’s death. A Holdren Historian tells me that Lettie Holdren Pickett literally changed the name from Holden as it appears on census to Holdren, but we do not know the reason why! His wife was Cecilia Mericle, daughter of Levi and Eunice Cogswell Mericle. She was born September 25, 1845. Both were members of the church. Nothing more on Cecilia is recorded there. Could she possibly be here in Cogswell too? Linnie, Our Darling, that’s all it records, on the right edge of the cemetery, part way up behind the Atkins lot in another row. There is an Abel Miller who married Aurissa Carter in 1872. This most likely is the same fellow. The church record her named spelled as Olie. Charles Newman in this Cemetery might be the same Charles Newman that married Josephine Gertrude LaFrance, daughter of Ziba and Caroline McClaud LaFrance. Josephine and Calvin have one child named F Eva who married a Mr Brown. Josephine married John Grose for her second husband. E Parkhurst, stillborn baby girl. The hand-etched headstone records September 22, 1935. Located near the top on the left side of the cemetery, I pulled it out of the brush! This family lived in the Silvara area and was respectfully known as the Piecrust family! Clara is at the very top all by herself on the right side of the cemetery. Undoubtedly were more buried up there with her, however no headstones are visible. She is the daughter of Levi and Cornelia Baker Bennett. She married to Horace Ruger. 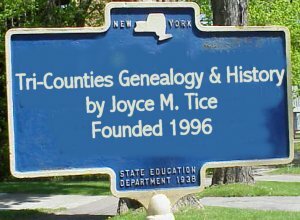 However family records record she was born 1854 in Wyalusing, PA. The stone was probably placed there some years after her death, as the style of headstone is a much later style. I don’t know if the death date is correct either as the Bennett Genealogy records she died about 1890 and has a daughter. William Ruger informs me that Horace was the son of William D and Louisa Ruger. He married second to Jane Woodruff and had three more daughters, Mabel, Anita and Zena. Ruger, Eliza, wife of Jeremiah Ruger, died April 5, 1890 age 82 years 2 months 16 days. Her stone lies flat on the ground and is quickly being swallowed up by the earth! Shaw, Frances (Bacon), 1856 to 1949. This stone is with the Ward Cogswell family. Frances would be Minnie Bacon, the wife of Ward Cogswell’s sister. They are children of Ezra Butler and Malinda Prentice Bacon. She was the wife of Henry T Shaw. Her stone is simply etched but lies flat on the ground. His wife was Mary Newman. Smith, Raymond E, son of Philander and should be Mary but it is illegible. Wakeman, Almon, 1822 to 1905, his stone lays flat on the ground. Slowly disappearing! Betsey died in full harness of the Lord according to the secretary’s book on page 29. Her last words were GLORY! Wood, William J, died January 17, 1898. Clipping form an unknown newspaper in the clippings of Mae Fassett. His wife Sharon (Sarah) Owens died June 25, 1874 and is buried in the Spring Hill, Tuscarora Township Bradford County, PA cemetery. Transcribed by Nicole Parker, spelling is as recorded as are the punctuation and graphic marks..
Beginning on line of land belonging to Jackson Cogswell on the woody margin of Tuscarora Creek and recognizing on said line East 16 rods - Then at right angles South 16 rods ~ Thence at right angles 16 rods ~ Thence West 16 rods to the woody margin of the Creek ~ Thence along the woody margin to place of beginning. Containing one and one half acres the some that is enclosed by a Fence of peakets & evergreen be the some more or less! Also the right of way from the Road to the Cemetery along the woody margin the same that is enclosed by a Fence be the same more or less. To have and to hold the above granted premises to the said society and their successors for a cemetery forever. And I the said, Bela Cogswell for myself and my heirs executors and administrators do covenant with the said John Tillinghast and the above named Society his heirs & their successors that I am **fully seized in fee simple of the afore granted premises. That they are free from all in cumbrances. That I have good right to all and convey the sane to said Society, their successors and assigns forever as afore said and shall warrant and defend the same to the said society & the successors and assigns forever against the lawful claims and demands of all persons. And it is further agreed and coordinated by the said, Bela Cogswell & the Free Baptist Church Society with the said John Tillinghast & his heirs & assigns that the said Tillinghast shall have all control of said Cemetery to lay out lots, number and prize them, lay out paths ornament and so all other things. The same as if the Cemetery was his to all intents and purposes sell and receive the pay for Lots. He or his heirs and assigns until 1878 Dec. 31. Where he shall give up the possession of the Cemetery to the Society, beholding all the unsold Lots as his non-private property, except lots to the amount of one hundred dollars of his opon selection, as an endowment to said Society. It is further agreed by the above parties that at all times strangers & the poor shall be allowed a place of burial in said Cemetery while unsold Lots remain. It is further agreed that all Lots sold in said Cemetery, A primated certificate shall be given to the purchaser, signed by the insident and Secretary or Treasurer of said Society and such Certificate shall constitute a clear title under this Deed. No lot in the Cemetery shall be taxed for repair of Fence or and propose. Said Tillinghast to maintain in a good fence until 1878 Dec. 31 and the said Baptist Society forever after. This Contrast constitutes a part of this deed in such remain in binding force as the Deed itself. In witness where of I, Bela Cogswell and I, Lydia Cogswell wife of said Bela Cogswell in token of my release of all right of and title of dower in the granted premises have here unto set out hands and seals this seventh day of April in the year of our Lord eighteen hundred & seventy one. Before me the inscriber one of the Justice of the Peace in & for said County personally come the within named Bela Cogswell & Lydia, his wife who in due form of law acknowledged the within indenture to be their act & deed & desired the same might be recorded as such. The said Lydia being of full age & by me examined separate and apart from her said husband & the contents of the foregoing Indenture being first made fully known to her declared that the did voluntarily & of her own free will & accord seal & as her act deed deliver the same mittant any coercion or compulsion of her said husband. In testimony where of I have here unto set hand & seal this seventh day of April AW 1871. I am the daughter-in-law of Beryle Holdren Ciprich and have been working on the Holdren family for many years. The name Holdren for this family was never Holden, and was never changed by Aunt Letty. It was just misprinted and misinterpreted. The transcript for the 1860 census lists William Henry Holdren as Henry Holdrew in Paupack Twp., Wayne Co., PA. That is where his father, Henry Holdren (1794-1848), and mother Mary Paul (1807-1865) are buried, Lakeville Cem., Paupack Twp., Wayne Co., PA. The first Henry Holdren (1753-1854), William Henry's grandfather, is buried in Honesdale, Wayne Co., PA, and was in the American Revolution. William Henry Holdren was married to Sarah Ann Wood, granddaughter of Revolutionary War soldier Consider Wood. Daughter Anna, nicknamed Amy, married Judson Squiers, daughter Lillian died young without marrying, son Charles married an Estella whose maiden name I have not determined, son David is sometimes listed as Beebe which I think must have been his middle name, daughter Lettie married Wesley Pickett and had no children, and the youngest child was Franklin, married to Alice Wandall, and whose only child, Burr Holdren, is my husband's grandfather. We named our son Burr after Burr Holdren, and Burr and Daisy had another grandchild, Frank Holdren, through their son Robert Holdren. Frank and his family live in Black Walnut, Wyoming Co., today. I have an old picture of the 5 surviving Holdren children in their adult years that I can email you if you would like to have it. Your description of the deterioration of the cemetery is very good. I was back a few years ago to take some digital pictures. I was amazed at how much worse it was then 25 years ago. It's a terrible shame. I really appreciate, as I'm sure many others do, all the work and effort you have put into your web pages. It is so wonderful to be able to sit at home and access information in minutes that I use to have to go to the library and run through microfilm machines for hours!